You can use the Leap Motion Java libraries in a Processing Sketch (in Java mode). This involves adding the Leap Motion files to the Processing libraries folder and importing the Leap Motion classes into the Sketch. 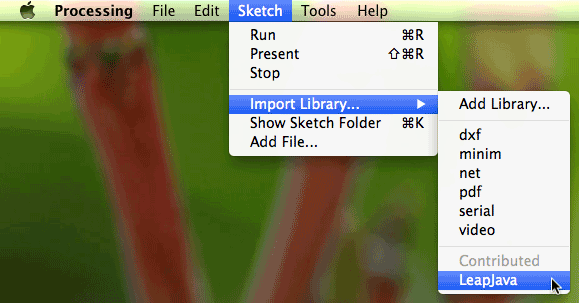 Find the folder named libraries in the Sketchbook folder, if it exists. Create the folder, if necessary. 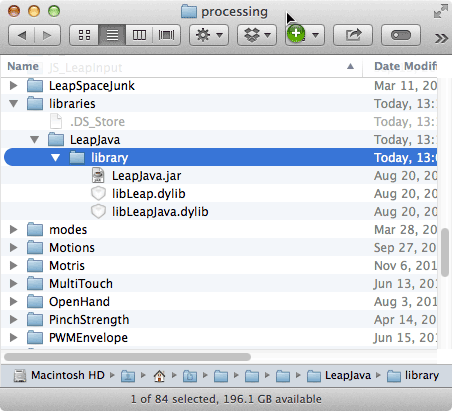 Inside libraries, create a folder named, LeapJava. Inside LeapJava, create a folder named, library. On Linux and Windows, you must make sure that you use the 32bit versions of the libraries with the 32bit versions of Python and the 64bit libraries with 64bit Processing. Now create a simple sketch using the Leap Motion libraries to make sure things are set up properly. The Leap Motion Controller object is the source of tracking data (in the form of Frame objects). Since this is in the draw() function, the frame containing the tracking data is updated at the frame rate of the sketch. And that’s all there is to it. You can now use the full Leap Motion Java API. The standard Processing Export Application command works for the current platform – in other words, you can build an application package for the Mac if you are currently programming on a Mac. However, since the Leap Motion Java API calls native libraries, you must copy the correct libraries into the versions for each Operating System and Platform that you export (see the table above). Note that the Leap Motion SDK download only includes the libraries for a single operating system. You must download SDKs for the other operating systems separately.